New Delhi: The Vice President of India, Shri M. Venkaiah Naidu said that India must equip farmers with knowledge, insights and products. 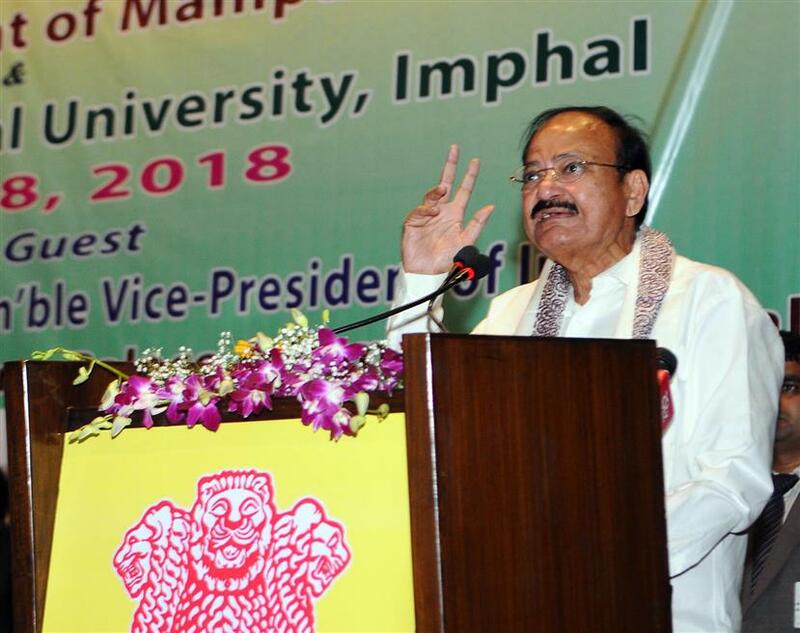 He was addressing the Valedictory Session of the One Day State Level Workshop on Biodiversity and Sustainable Agriculture for Doubling of Farmer’s Income” organized by the Government of Manipur and the Central Agricultural University, in Imphal, Manipur today. 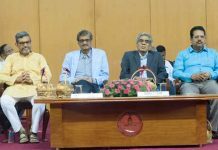 The Governor of Manipur, Dr. Najma Heptulla, the Chief Minister of Manipur, Shri N. Biren Singh, the Minister for Agriculture & Animal Husbandry, Shri V. Hankhanlian and others dignitaries were present on the occasion. “I am really happy to be with all of you today. The state of Manipur, which is referred to as Jewel of the East by the first Prime Minister of India Pt. Jawaharlal Nehru, is true to its core a jewel. The state is in the Eastern Himalayas which is one of the ten biodiversity hot spots of the world. Though the state is geographically small, it has a number of natural endowments. It is bestowed with varied geographical and climatic regions which have helped in evolving a great array of diverse species of both flora and fauna. Even the ethnic diversity is striking. The people of Manipur have not only realized the importance of biodiversity but it is heartening that they have been helping conserve this unique boon given by nature. The unique black scented rice of Manipur or the perennial vegetables, the tree bean or the tree tomato and many fruits which are endemic speak volumes about the diversity of the flora. Siroy lily the state flower is unique to the State of Manipur. The aqua diversity is also unique. Pengba fish, the most favorite fish in Manipur, is also endowed with several medicinal benefits. The floating islands on the largest fresh water lake of North East India are also home to several unique aquatic fauna and the forest adjoining the lake is the home of the state animal “Sangai”. The state is also fortunate to receive very heavy rainfall throughout. Agriculture has been and continues to be the main occupation of the majority of Manipuris. Over millennia, the farmers have developed agricultural production systems which blended well with nature and maintained the ecological balance. The agricultural production is largely organic because it is based on traditional methods therefore making it highly organic in nature. The tribes in the hilly region still follow Jhum cultivation which in its natural way does not adversely affect the natural resources. In recent times, however, reduced rotational periods of jhuming (Jhum cycle) is putting pressure on the natural resources. I am told that the rotation has come down to 3 to 4 year cycle from its traditional 12 year cycle. This has its ramifications and negative impact on the environment. The changing weather pattern with reduced rainfall (which is almost 50% compared to 3 decades earlier) with its erratic distribution is partly ascribed to this reduced Jhuming cycle. It would be important to study this problem and find a practical solution to ensure sustainability of the production systems as well as address social issues like improving the socio economic status of the jhum farmers. Alternate economic activities should be developed so that the jhum farmers are encouraged to lengthen the jhum cycles and ultimately bring them to the earlier length of 12 years or even more. Adoption of modern agricultural methods is still rudimentary in Manipur and there is a need for bringing the state of the art knowledge and agricultural skills to the farmers’ doorsteps. I am happy that Central Agricultural University and the ICAR Regional Centre at Imphal have developed several useful farmer friendly technologies which have a great potential to boost the agricultural production of the region while conserving the mother nature. This knowledge must reach all farmers. The department of agriculture therefore has a greater role in transferring this accumulated treasure of knowledge to the farmers for adoption. In my view, the extension activities of the department of agriculture should be geared up to step up the process of dissemination of this accumulated knowledge. We must blend the best practices from the traditional farming with the latest know-how. Central Agricultural University, ICAR and IBSD have a great role to play. They should maintain the diverse collection of rice germplasm so that they are available for the development of varieties blending with location specific genes.The Central Agricultural University and ICAR should also develop organic pesticides using local flora so that the pests are controlled without the use of toxic chemicals. This will reduce the pollution of the precious soil and water bodies. Along with sustainable agriculture, we need to focus on using our water resources also in an optimal fashion. Although the state is bestowed with good rainfall, there is an urgent need to conserve these resources. In my view, not only should we construct ponds for water conservation but also convert these artificial water storage structures into active fresh water ecosystems which in turn will be biodiversity spots for the aquatic wealth of the state. When we talk of biodiversity and its conservation, we should also address the global warming and its effect on biodiversity of the region. Global warming is real and is affecting our lives in every way. It should therefore be our endeavour to sustain the agricultural production by mitigating the effects of global warming while conserving the biodiversity in ways that are sustainable. Agriculture sector needs a big boost today. We should make it sustainable, economical and attractive. We need to focus on the farmer’s incomes as well as on the farm productivity and long term environmental sustainability. Enhancing productivity is important. Providing quality seeds of high yielding varities of crops to farmers at the right time and increased farm mechanization will be helpful. The Agricultural University can be a catalyst in this transformation. Apart from intensification of agriculture, we must go in for greater diversification. Farmers should be encouraged to go in for a greater variety of alternative crops like high value fruits, vegetables and medicinal plants. Allied occupations like dairy and aquaculture add to the farmer’s incomes and cushion them against the uncertainties of traditional agriculture. Infact, the entire agriculture sector must be seen in an integrated manner. The post-harvest operations, warehousing, cold storage, marketing and food processing, credit and insurance facilities are interlinked parts of the larger eco-system. We must effectively strengthen these linkages. Efforts should also be made to conserve the endangered Manipuri cattle and pony which are unique to this region. Also, simultaneously there has to be a constant research on improving the breeds of dairy animals, poultry birds, fish and duck suitable for the region. I am happy to participate in this State level Workshop that has focused on themes that are close to my heart. I have always held that agriculture has been at the heart of our culture. Most of our festivals and folksongs have roots in the agricultural practices. We must rejuvenate agriculture, preserve our culture, conserve nature, reform our work culture. If we can do this we can transform our future. We need to create our tomorrow through our actions today. You have the ‘Manis’, the ‘jewels’ in your state in the form of the vast natural and human resources. Let us celebrate and conserve the rich diversity nature has endowed you with and add further shine to the already splendid nature’s treasures. I wish you all success in your collective endeavors.